From the Department of Neurosurgery (K.J. Sweadner, E.A., J.T.P. ), Center for Human Genetics Research (K.J. Swoboda), and Department of Neurology, (K.J. Swoboda, L.J.O.) Massachusetts General Hospital, Boston; and the Department of Neurology (A.B. ), Wake Forest School of Medicine, Winston-Salem, NC. Objective We tested the assumption that closely related genes should have similar pathogenic variants by analyzing >200 pathogenic variants in a gene family with high neurologic impact and high sequence identity, the Na,K-ATPases ATP1A1, ATP1A2, and ATP1A3. Methods Data sets of disease-associated variants were compared. Their equivalent positions in protein crystal structures were used for insights into pathogenicity and correlated with the phenotype and conservation of homology. Results Relatively few mutations affected the corresponding amino acids in 2 genes. In the membrane domain of ATP1A3 (primarily expressed in neurons), variants producing milder neurologic phenotypes had different structural positions than variants producing severe phenotypes. In ATP1A2 (primarily expressed in astrocytes), membrane domain variants characteristic of severe phenotypes in ATP1A3 were absent from patient data. The known variants in ATP1A1 fell into 2 distinct groups. Sequence conservation was an imperfect indicator: it varied among structural domains, and some variants with demonstrated pathogenicity were in low conservation sites. Conclusions Pathogenic variants varied between genes despite high sequence identity, and there is a genotype-structure-phenotype relationship in ATP1A3 that correlates with neurologic outcomes. The absence of “severe” pathogenic variants in ATP1A2 patients predicts that they will manifest either in a different tissue or by death in utero and that new ATP1A1 variants will produce additional phenotypes. It is important that some variants in poorly conserved amino acids are nonetheless pathogenic and could be incorrectly predicted to be benign. We expect that genes that diverged only slightly after past duplications should have similar pathogenic variants. The Na,K-ATPase gene family provides a good test data set because there are >200 different human mutations (in >800 patients or families), and the proteins and many mutations are well studied.1,–,4 All known pathogenic variants are de novo or have dominant inheritance. ATP1A1 is expressed in most tissues, including neurons and glia in the brain. ATP1A2 is expressed in astrocytes; skeletal, cardiac, vascular, and smooth muscle; and adipocytes. ATP1A3 is not only in neurons but also in cardiac and several other tissues. Few pathogenic variants have been discovered in ATP1A1 so far in Charcot-Marie-Tooth neuropathy and aldosterone-producing adenomas. In contrast, there are multiple germline neurologic diseases of ATP1A2 and ATP1A3. The Na,K-ATPase paralogs have the same fundamental ion transport mechanism.8 Sodium-bound and potassium-bound conformations are shown in different crystal structures (figure e-2, links.lww.com/NXG/A134). Variant locations in crystal structures can sometimes be related to specific enzyme functions. Mutations can produce effects on Na,K-ATPase activity, ion affinity, ion leakage, or biosynthesis. We investigated whether there are correlations between pathogenic variants (missense and 1-codon deletions), their positions in protein structure, evolutionary conservation, and the spectrum of disease phenotypes. The literature was searched for mutations by gene symbol. Disease variants in ATP1A1 were from aldosterone-producing adenomas (APAs)3 and cases of Marie-Charcot-Tooth type 2.4 Variants in ATP1A2 were from familial (FHM2), sporadic hemiplegic migraine, and epilepsy syndromes.2,9 Variants in ATP1A3 included alternating hemiplegia of childhood (AHC), rapid-onset dystonia–parkinsonism (RDP), and other milder and more severe neurologic manifestations found by genome sequencing of undiagnosed patients.1,10,11 Some variants in ATP1A3 were from our own patients, and a few alternative codons for known mutations were from ClinVar ncbi.nlm.nih.gov/clinvar/). The reference sequences were NM_000701.7 (ATP1A1); NM_000702.3 (ATP1A2); and NM_152296.4 (ATP1A3). Many suspected mutations have been tested in the laboratory for pathogenicity, but not all. The criteria for including variants in the analysis are detailed in supplementary information. All variants that met the criteria were included regardless of diagnosis. Na,K-ATPase protein crystal structures in Na+-bound and K+-bound conformations at the highest available resolutions, 3WGU, 3KDP, and 2ZXE,12,–,14 were from the PDB database (rcsb.org). The positions of variants were studied in Swiss PDB Viewer 4.1 based on the homology of the aligned sequences (figure e-1, links.lww.com/NXG/A134). Sequence conservation was computed with the ConSurf server (consurf.tau.ac.il/2016/) with default parameters, using the structure of the pig α1 Na,K-ATPase (3KDP) and its sequence as input. ConSurf searches for homologous sequences, and highly similar sequences are removed so that a broad spectrum of evolution is covered15; more detail is in supplementary data and figure e-3. The resulting conservation scores were graphed with GraphPad Prism with aligned human α1, α2, and α3. No human experimentation was performed. Written informed consent was obtained from all patients or their guardians for cases not taken from the literature. All variants are listed in supplementary information tables links.lww.com/NXG/A134. The premise that high sequence conservation predicts variant pathogenicity implies that paralogs with high sequence identity should have similar variant distributions in the protein structure. ATP1A2 and ATP1A3 have the most disease-associated variants for comparison (figure 1A): 77 in ATP1A2 and 130 in ATP1A3 at this writing, including alternative substitutions (e.g., p.D801 to p.D801N and p.D801Y). There are striking differences, however, in the proportion of disease variants found in different protein domains of ATP1A2 and ATP1A3 (figure 1B). Such differences would not be predicted by shared enzyme mechanisms and high sequence identity. Disease-causing variants in ATP1A2 and ATP1A3 should frequently appear at the corresponding amino acids. Instead, of 154 mutated amino acid positions in the 2 genes (68 in ATP1A2 and 86 in ATP1A3), only 18 mutated amino acids overlapped. (A) Ribbon diagrams of Na,K-ATPase in the K+-bound conformation. Bound K+ is shown as pink spheres. Extracellular portions include the β-subunit (green; transmembrane portion removed for clarity) and extracellular loops of the α-subunit (magenta). The 10 transmembrane α-helices are white. The cytoplasmic domains are the stalk (S, lavender), phosphorylation domain (P, red), nucleotide binding domain (N, gold), and actuator domain (A, yellow). Spacefill residues are the backbones of each amino acid mutated in ATP1A2 or ATP1A3. Color shading is varied to help distinguish different amino acids. For ATP1A2, 76 different DNA variants occur in 66 amino acids, i.e., 10 amino acids have 2 alternative codon changes. Three of the mutations are single amino acid deletions. For ATP1A3, 130 different DNA variants occur in 86 amino acids; 5 are single amino acid deletions, and there are 25 amino acids with 2–6 alternative codon changes. All 18 overlapping residue pairs (including 3 where one was found in ClinVar) were identical before the mutation. In 6 pairs, the amino acid change was different; in 8, it was the same; and in 4, both identical and different substitutions were found (i.e., alternative codon changes). (B) Linear diagram of the domain substructure. Both the A domain (yellow) and the P domain (red) are composed of 2 parts that are separated in the linear structure. As in (A), the extracellular loops are magenta. The stalk domain comprises 5 separate parts: the cytoplasmic extensions of the M4 and M5 transmembrane spans S1 and S2; the short intracellular loops L6-7 and L8-9; and the C-terminus (lavender). For ATP1A2 and ATP1A3, domain lengths are proportional to the number of distinct variants found (including alternative codon changes). Although variants are found in most domains, ATP1A2 has an excess in the P domain, and ATP1A3 has an excess in the membrane domain. Although more such overlap should emerge with time, the low level of overlap is not simply that there are not enough cases yet: it contrasts sharply with the number of recurring variants. First, there were many cases in which alternative codons produced different substitutions of an amino acid: 25 amino acids in ATP1A3 had alternative substitutions (up to 6), and 13 amino acids in ATP1A2 had 2 alternative substitutions. Second, for ∼600 independent occurrences of variants in ATP1A3 patients (a family is 1 occurrence), 62% have recurred twice or more, and of those, more than half have recurred 5 or more times. ATP1A2 has many fewer reported occurrences (∼160), but 20% of their mutations recurred. Of the 18 pairs of variants overlapping in ATP1A2 and ATP1A3, none involved highly recurrent mutations. These data suggest that there is little bias toward crucial residues shared by ATP1A2 and ATP1A3 but strong bias for other residues. Singletons and families in the literature were ascertained by symptoms suspicious of a genetic origin. Separate clinical diagnoses such as RDP and AHC were independently linked to ATP1A3.10,16 The divergence in structure distribution suggests the existence of genotype-structure-phenotype relationships. Additional phenotypes for each gene may yet be discovered. Human disease variants in ATP1A2 and ATP1A3 produce neurologic syndromes with onset at birth, in childhood, or in adulthood, including familial hemiplegic migraine (FHM2 [MIM:602481]),2 RDP (MIM:128235),1,29 AHC (MIM:614820),1,2 and cerebellar ataxia, areflexia, pes cavus, optic nerve atrophy, and sensorineural deafness (CAPOS [MIM:601338]).11 Disease variants in ATP1A2, expressed in astrocytes, produce FHM2 phenotypes associated with spreading depression or spreading excitation: migraine, hemiplegia, and seizures.2 Symptom severity has not been systematically studied for ATP1A2 mutations,2,17 but ATP1A3 disease variants can be divided by severity.10,11,18,–,20 The most severe are defined by onset in infancy and include AHC,1 severe infantile epilepsy,18,21 and severe hypotonia.22 Milder phenotypes have onset in children and adults and include RDP, CAPOS, relapsing encephalopathy and cerebellar ataxia19 also called fever-induced weakness and encephalopathy,23 and rapid-onset ataxia.20,24 Ages at symptom onset were taken from original reports. Figure 2 highlights a structure-phenotype relationship in the membrane domain. ATP1A2 and the milder phenotypes in ATP1A3 have a scattered distribution, but the ion binding site is almost devoid of variants. In contrast, the variants with severe phenotypes in ATP1A3 are clustered around the ion binding sites, as noted previously for AHC.25,–,27 Three residues in ATP1A3 with either mild or severe manifestations are pale yellow and not close to the ions. The absence of known ATP1A2 mutations near the ions suggests that their effects are too severe to manifest as hemiplegic migraine. The P domain, the site of ATP hydrolysis, is highly evolutionarily conserved. Figure 3A dissects this domain because its structure is otherwise difficult to appreciate. Two distant stretches of amino acids (P1 and P2) interdigitate in a twisted sheet of β-sheet strands encircled by α-helices. In figure 3A, the top row shows an end view of the β-sheet, the α-helices that surround it, and the 2 parts combined. The active site has an aqua magnesium ion. The second row shows a side view of the same structures. Figure 3B shows the distributions of mutated amino acids. In the β-sheet, all but 3 are clustered at the face of the active site. In the ring of α-helices, all mutations except 1, in magenta, are away from the active site. The helix mutations are confined to the central 5 of the 9 helices. The more distal helices and strands so far have no mutations. The P domain is the most conserved in the gene family. It is covalently phosphorylated during transport, and the Mg2+ ion (aqua) is at the active site. (A) The P domain consists of 2 halves that are separated in the linear structure but that interdigitate in a complex way when the protein folds. The first half, P1 in figure 1B, is shown in pale yellow, and the second half, P2 in figure 1B, in pink. There is a twisted β-sheet (left views) surrounded by α-helices (middle views). Strands and helices are numbered in the order found in the sequence. (B) The known mutations are displayed with color coding as indicated. Stick view is used for mutations in the β-sheet to avoid overcrowding. Note how most of the side chains of the mutated residues extend down into the active site surface. Spacefill view of the mutations, without side chains, is used for the α -helices. Note how the mutations are confined to just 5 helices: helix 1, which is associated with the stalk domain, and 4 helices that form a belt around the middle of the P domain: 2, 3, 7, and 8. There are no mutations in the end strands (1 and 4) or the end helices (4, 5, 6, and 9), which may be less important to function. The magenta mutation in an α-helix is the only helix mutation near (but not in) the active site. It is ATP1A3 T613M, a recurrent RDP mutation. The data indicate that the ATP1A2 and ATP1A3 distributions of mutations are very similar in the P domain, but there are 2 types of mutations. Most of the mutations in the β-sheet are at the active site. Most of the ones in the α-helices are distant from the active site. There was no correlation with phenotype severity. In Figure 3, color distinguishes the variants found in ATP1A2, ATP1A3, or both. All have similar patterns of distribution in the P domain. Figure e-4 (links.lww.com/NXG/A134) compares the mild and severe phenotype variants of ATP1A3. Any suggestion of differences in location would need to be supported by further evidence. Figure e-5 compares the ATP1A2 and ATP1A3 variants in the S domain. On the whole, P domain and S domain mutation distributions do not differ systematically between ATP1A2 and ATP1A3. Presumably because ATP1A1 is essential in early embryonic life, not many disease variants have been discovered. Those fall into 2 groups with different characteristics. Seven ATP1A1 putatively pathogenic variants found in Charcot-Marie-Tooth (CMT2) axonal sensorimotor neuropathy are in the cytoplasmic A, P, and N domains, and 1 is at an ion binding residue frequently mutated in ATP1A3 but with a less disruptive substitution (figure 4A). Adrenal adenomas, like many cancers, have a high somatic mutation rate, and APAs have distinctly different ATP1A1 variants (short deletions and missense), all in the membrane domain (figure 4B).28,–,31 Those tested for function showed reduced Na,K-ATPase activity, cell depolarization, or a modest inward leak current.28,29,32,–,34 The amino acids of the most recurrent adenoma variants, p.Gly99Arg, p.Leu104Arg, and p.Val332Gly, had previously been shown to line the ion pathway or function as gates: their chemical modification blocked palytoxin-induced currents caused by the toxin's ability to bind to Na,K-ATPase and wedge it open.35 In sum, the CMT2 ATP1A1 disease variants are likely to cause a mild loss of function, and the adenoma variants may cause a gain of function with limited currents leading to aberrant aldosterone production. There are only a handful of known mutations for ATP1A1, but they fall in 2 clearly different groups. (A) Seven germline mutations were found in CMT2 patients.4 One is at the interface between the 2 halves of the A domain (A1 dark pink, A2 yellow), where it may interfere with A domain stability. One is at the site equivalent to D801N, the most common AHC pathogenic variant, but the change is from aspartate to alanine, presumably a milder substitution. The other 5 variants are close to the boundary of P and N domains. They do not appear fundamentally different from mutations in ATP1A2 or ATP1A3. I592T in ATP1A1 (orange) is the residue equivalent to I589T in ATP1A2.59 (B) The other group is somatic mutations found in aldosterone-producing adenomas.3 (Left) Six of the missense mutations all lie along the ion path through the protein, and some alter amino acids that are believed to be gates. The seventh is at the top of the extracellular mouth (green). Two of them, V332G and L337M, are less disruptive versions of mild pathogenic variants in ATP1A3: V322D and L327del. (Right) Multiple different short deletions (of 2–6 amino acids) appear only in the 3 stretches of amino acids highlighted in membrane spans 1, 4, and 9. Such deletions have not been reported for ATP1A2 or ATP1A3. These somatic mutations are in a class by themselves. They are believed to generate slight leaks, large enough to lead to aldosterone production but not large enough to kill the cells. To determine whether mutations are in amino acids with high evolutionary conservation, we used ConSurf to estimate conservation based on 94 nonredundant homologous sequences from the P-type ATPase superfamily, from vertebrates to yeast and bacteria.36 Figure 5A shows the conservation scores of all residues as small blue symbols, and the bar shows the locations of domains as in figure 1B. The 2D presentation highlights that for much of the protein, high conservation and low conservation residues are closely interspersed in the linear sequence. Shaded boxes highlight 2 nonrandom features. First, there are 3 large stretches of conserved residues (tan) with practically no low conservation residues (off-white). In the right off-white box, at around amino acid 800, there is a vertical streak of less-conserved residues that correspond to a loop in the extracellular domain, which is magenta on the domain bar. Second, there are 2 stretches of amino acids that are depleted of high conservation residues (lavender boxes). Because conservation was calculated using sequences that are related but have divergent functions, we infer that these regions, rather than being of lesser importance, evolved for functions not shared by more distant homologs: regions of special interest for ATP1A1, ATP1A2, and ATP1A3. Human ATP1A1, ATP1A2, and ATP1A3 amino acid sequences were aligned with Sus scrofa ATP1A1 (the species used in protein crystal structures 3KDP and 3WGU), and each residue affected by a disease variant was assigned the conservation score calculated for ATP1A1. (A) The individual conservation scores of all aligning amino acids are shown with score on the Y axis and amino acid sequence (1–1,023) on the X axis. As seen in figure e-1 (links.lww.com/NXG/A134), there is no alignment at the N-terminus, so N-terminal residues do not appear. Each blue spot is one amino acid, and the Na,K-ATPase domains are illustrated in the bar at the bottom. Some patterns of conservation can be discerned, highlighted by transparent boxes: two regions with few or no highly conserved amino acids (lavender) and 3 regions of conserved residues (tan) with practically no low conservation residues (off-white). (B) The ATP1A2 variants (green) and the mild ATP1A3 variants (magenta) have similar distributions. There are 14 cases (∼15%) where homology scores were in the less-conserved half. The C-terminal region has many pathogenic variants in both genes despite lacking the highest conservation scores. Residues E174 and R1008 from figure 6 are marked with arrowheads. (C) The severe ATP1A3 variants had a more restricted distribution. It can be seen that many align with the membrane spans. Although their conservation scores varied widely, none were in the less-conserved half. Of the points that do not lie in one of the 3 clusters of high conservation, 8 were shared by mild and severe ATP1A3 phenotypes (visible as 2 colors per symbol at high magnification). This suggests that intermediate phenotypes tend to have less restricted structure distributions than the most severe phenotypes. (D) All the synonymous (brown; n = 281) and missense (coral pink; n = 145) ATP1A3 variants from gnomAD (138,632 sequences) are plotted to compare to the clustering of mutations. The average conservation scores for missense variants found in patients were similar for all 3 genes at the 30th percentile (data not shown). Two-thirds of the mutated residues were in the highest 20%, and only 3% were in the lowest 20%. 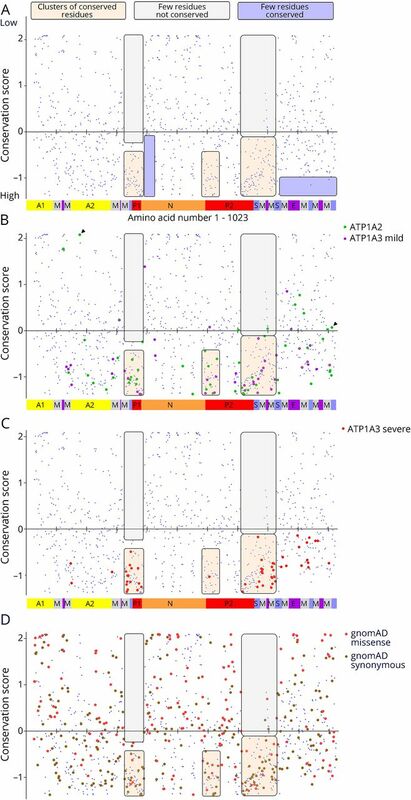 The conservation scores were graphed to look for patterns unique to ATP1A2 and mild-phenotype ATP1A3 (figure 5B) and severe ATP1A3 (figure 5C). A difference in the distribution of variants is clear both in the location and conservation score, with the severe-phenotype ATP1A3 variants being more restricted and all falling below zero on the graph (5C). Another difference that cannot be appreciated on the graphs is that 65% of the severe ATP1A3 variants are recurrent, whereas the proportion is 38% for mild ATP1A3 variants and 20% for ATP1A2. The region at the C-terminus with no very high conservation residues has many mutations (figure 5, B and C). Normally, one would expect that variants with low conservation scores are benign. In the ATP1A2 and mild ATP1A3 variants in figure 5B, 14 amino acids have positive (poor) conservation scores. Of these, 10 were supported as pathogenic by laboratory testing of function, recurrence as an alternative amino acid, or occurrence in a second gene, and 3 of those were de novo. There was no pattern in their scores. Three others had insufficient data, and a fourth was published as possibly disease causing and is analyzed further. The missense and synonymous variants in gnomAD gave no obvious pattern (figure 5D). More than half (58%) of the synonymous variants were in the higher half of the conservation score, whereas only 39.3% of missense variants were (p = 10−5 t test, 2 tailed, equal variance) consistent with genetic constraint. ATP1A2 variant E174K has a conservation score of 2.077, putting it at the top of figure 5B. The variant appeared in a family that experiences migraine with side-changing paresthesias, which is on the FHM2 spectrum.37 Pedigree data were supportive but incomplete. When expressed in Xenopus oocytes, no reduction of pump activity was seen,37 but the ion concentrations used were high enough to saturate the enzyme. In later experiments using protein expressed in insect cells, it was learned that the enzyme had altered kinetics: reduced affinity for Na+ and increased affinity for K+.38 Because Na+ concentration is rate limiting for enzyme activity in vivo, this mimics reduction of activity. Figure 6, A and B illustrate how the position of E174 in the crystal structures explains the pathogenicity. E174 is at the surface of the A domain, which rotates. In the K+-bound structure, E174 faces the cytoplasm, and the side chain is in contact with nothing (figure 6A). In the Na+-bound form, however, it binds 2 amino acids in the N-domain (figure 6B), i.e., it is at a domain-domain interface where the change from negative to positive charge will be damaging. This explains the abnormal kinetics because the sodium conformation would be destabilized.38 In this example, an amino acid with the worst conservation score nonetheless is legitimately pathogenic. (A) E174K; N, P, and A domains are visible. In the K+-bound conformation, the N (gold) and A (yellow) domains are far apart. (B) In the Na+-bound conformation, the N and A domains are in contact. The P domain in the background was hidden for clarity. E174K (magenta) is a variant in ATP1A2 that has the poorest conservation score in figure 5B, and it is predicted to be tolerated by SIFT.38 In the K+-bound structure, it is fully exposed to the cytoplasm (A), but in the Na+-bound structure, it is the point of closest contact between the A domain (yellow) and N domain (gold). There it interacts with 2 adjacent residues, an asparagine N432 and an alanine A433 (blue and aqua). They are also shown in (A). (C) R1008W; close-up of M10, M7, and M8 where these helices terminate in parts of the S domain (lavender). R1008W (magenta) is a variant in ATP1A2 in a patient with compound heterozygosity with R548C. Because the adjacent variant R1007W (green) is known to be pathogenic, it was suggested that R1008W might contribute to the severity.39 R1007 has a better conservation score, but R1008's score is still in the range of other pathogenic variants (close to zero). In the structure, R1007 points into the protein where it makes close association with 2 domains: two residues in M10 (light blue) and 2 residues in L7-8 (lavender), including the protein kinase A phosphorylation site, S933. In contrast, R1008 points out into the cytoplasm, where a substitution may be tolerated. The second example is ATP1A2 variant R1008W, which was found together with a known pathogenic variant, R548C, in a compound heterozygous child with unusually early onset of severe epilepsy, hemiplegia, and migraine symptoms.39 The severity of the phenotype, not seen in a family with R548C alone40 or in the child's mother who carried the R548C mutation, suggested that both variants contributed to disease severity. An adjacent arginine with the same substitution, R1007W, previously described in a family with hemiplegic migraine and epilepsy, was shown to be pathogenic by functional studies in Xenopus oocytes.41 Although R1007 has a conservation score in figure 5B of −0.967 while R1008 is +0.069, their identical substitutions suggested that the adjacent variants might both be pathogenic.39 However, their positions in the crystal structure tell a different story (figure 6C). R1007's side chain faces into the protein and makes contacts with 2 amino acids in M10 and 2 in the S domain. One of those contacts is the protein kinase A site, and R1007 had been shown previously by mutagenesis to play a complex role in controlling Na,K-ATPase.42 In contrast, the adjacent R1008 side chain points away from the protein, where it may associate with phospholipid headgroups.43 Adjacent amino acids can have very different propensities to be pathogenic. In this example, a variant with some apparently credible features, nonetheless, may be benign. 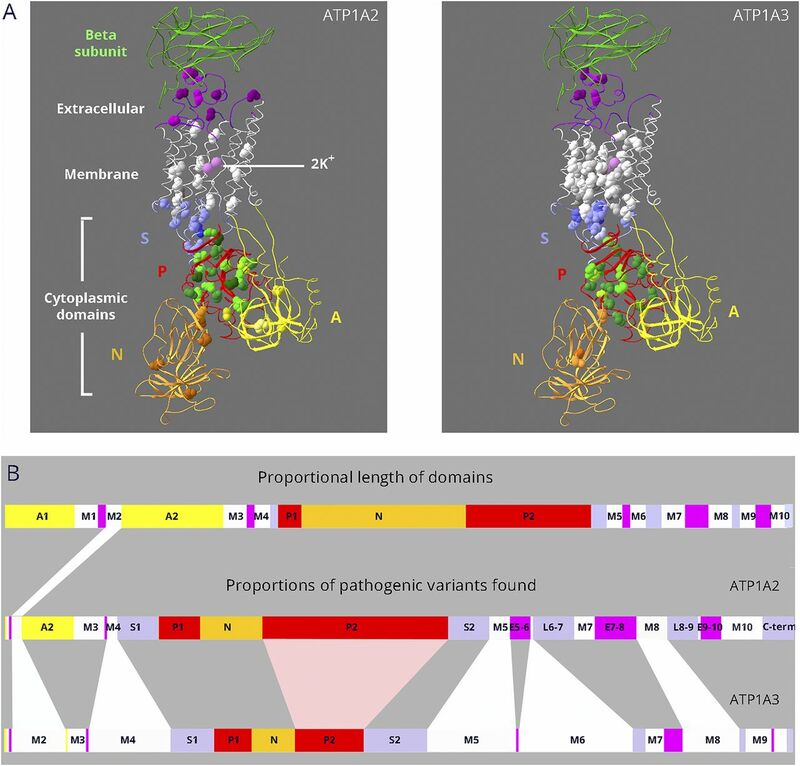 It was not expected that pathogenic variants seen in Na,K-ATPase paralogs would differ. The concepts of conservation of sequence homology and genetic constraint (intolerance of substitution) are tightly linked. The premise is that evolutionary conservation occurs because variants causing functional damage are eliminated by selection. This study documents that sets of paralogs can violate that logic at the disease level: sequence similarity between paralogs is not always a strong predictor for the discovery and interpretation of new human pathogenic variants. The Na,K-ATPase catalytic subunit gene family instead shows partial divergence in pathogenic variants. Ascertainment bias plays a role: patients must survive with the mutation, and symptoms must be uncommon enough to suggest monogenic disease. Mutations outside of these constraints would occur but be undetected. It is fundamental that mutation phenotypes can appear in one tissue or cell type and not another because of differences in how physiology is affected. Partial loss of Na,K-ATPase activity may have more impact in a cell with high transport activity than one with low activity; in inhibitory rather than excitatory neurons; or presynaptically rather than postsynaptically. An elevation of intracellular Na+ due to a reduction of sodium affinity may have more effect on dendrites than on action potentials or have different secondary effects on transmitter reuptake. Similar mutations in astrocytes and neurons can have different impacts on intracellular Ca2+, pH, or Cl− because of the expression of different sodium-dependent carriers. When comparing different mutations, however, variants that simply reduce activity should have a ceiling of physiologic impact; e.g., a mutation inactivating the ion binding site should have the same physiologic effect as a mutation inactivating the ATP hydrolysis site, provided both changes produce inert enzyme. Loss of function alone, however, does not explain why many ATP1A2 and ATP1A3 neurologic variants are biased toward specific mutations as suggested by their independent recurrence. To understand the genotype-structure-phenotype differences displayed by ATP1A2 and ATP1A3 and by mild and severe ATP1A3 mutations, we postulate a gain-of-function defect in the severe mutations. Certain mutations of Na,K-ATPase may cause a greater perturbation of physiology than pump inactivation alone by alteration of ion selectivity or stoichiometry; by depolarizing inward currents carried by protons or Na+; by leaks through the ion pathway because of defective gating; or by protein instability or misfolding in the membrane.28,29,33,34,44 Small inward proton currents occur in wild-type enzyme and are sometimes blocked in mutants, but their physiologic impact is still uncertain.26 Larger leaks or an outward proton current would be disruptive for both neurons and glia and potentially toxic. The extreme toxicity of palytoxin is due to the opening of the ion pathway through Na,K-ATPase like a channel.45 Any leaks in surviving patients should be very slow relative to palytoxin and might manifest only at physiologic temperatures or higher. The ATP1A3 variants that are tightly clustered around the ion sites would be candidates. So would sensitive spots such as G358 on the P1 helix embedded in the S domain, where a G358V mutation produced fatal infantile epilepsy18 and G358C, S, and D produce AHC. So would the highly recurrent AHC mutations E815K and G947R that have dominant negative effects46 and are in a network of residues affecting the cytoplasmic ion pathway.26,47 The importance of pathogenic leaks is supported by temperature-sensitive mutations studied in Ca+2 ATPases in Drosophila48 in addition to the aldosterone-secreting adenoma ATP1A1 mutations.28,34 Many other mutations, such as in the P domain, N domain, or extracellular surface, may affect only biosynthesis or activity. One significant observation is that the membrane domain pathogenic variants causing severe phenotypes in ATP1A3 are entirely missing from the ATP1A2 patient population. It is not that hemiplegic migraine ATP1A2 mutations are never fully inactivating: a number had no detectable activity in laboratory studies.2 Even among the variants shared by ATP1A2 and ATP1A3, however, none were close to the ion binding sites. The logical prediction is that severe variants of ATP1A2 occur but have unrecognized disease consequences. For example, they may produce membrane depolarization that interferes with astrocyte roles in synapse development and remodeling,49 and this clinically supersedes the cortical spreading depression that contributes to migraine.2 Other possibilities are a phenotype in other ATP1A2-expressing tissues (skeletal, vascular, smooth, or cardiac muscle; fat) or lethality, perinatally or in utero. The variants of ATP1A3 that we have called “milder” nonetheless produce disabling neurologic disease with stable, progressive, or episodic motor symptoms, often with cognitive deficits and psychiatric manifestations.1,50,51 No pathogenic variants have been found yet, however, in the N-terminus, the A domain, the linkers to the A domain, or some of the peripheral membrane spans, suggesting that their functional impact is too small (or too great) to produce recognized diseases. This gene family's mutational landscape shows that the spectrum of pathologic variants varies among paralogs. Important pathologic variants can occur in evolutionarily recent specializations that are not conserved at all. The mutations in ATP1A2 and ATP1A3 and the germline mutations in ATP1A1 were overwhelmingly missense or deletions of 1 codon, which suggests that the mutated protein must be present for the known manifestations. It will be interesting to see whether recessive mutations have a structural distribution more representative of sequence identity in the gene family. Design and execution of the study: K.J. Sweadner, E.A., J.T.P., and L.J.O. Contribution to genetic and phenotypic data and interpretation of data: K.J. Swoboda and A.B. Writing of the manuscript: K.J. Swoboda, E.A., and L.J.O. Revisions of the manuscript: all authors. Supported by NIH NS058949 to A.B. Dr. Sweadner serves on the advisory boards of DANDRITE and the Nordic EMBL Partnership for Molecular Medicine and has received salary support from NINDS R01NS058949 (AB). Dr. Arystarkhova has received salary support from NINDS R01NS058949 (AB). Dr. Penniston reports no disclosures. Dr. Swoboda reports grants and personal fees from Biogen, unrelated to the submitted work. Dr. Brashear consults about protocol development with Revance and Ipsen and has received salary support from NINDS R01NS058949 (AB). Her conflict of interest is managed by Wake Forest School of Medicine. Dr. Ozelius reports no disclosures. Full disclosure form information provided by the authors is available with the full text of this article at Neurology.org/NG. This work would not be possible without the patients and their families for their eagerness to contribute to research. The authors thank the Genome Aggregation Database (gnomAD) and the groups that provided exome and genome variant data to this resource. A full list of contributing groups can be found at gnomad.broadinstitute.org/about. They also thank the laboratories that produced crystal structures of Na,K-ATPase and Drs. S. Bressman, C. Brownstein, J. Damásio, S. DeBrosse, S. Demarest, W.B. Dobyns, L.M. Frank, S. Frucht, M. Mikati, F. Mochel, R. Schiffman, N.J.C. Smith, C. Toro, and L.A. Wolfe for sharing unpublished disease variants.
. Distinct neurological disorders with ATP1A3 mutations. Lancet Neurol 2014;13,503–514.
. ATP1A2 mutations in migraine: seeing through the facets of an ion pump onto the neurobiology of disease. Front Physiol 2016;7:239.
. Novel genetic determinants of adrenal aldosterone regulation. Curr Opin Endocrinol Diabetes Obes 2016;23:209–217.
. Mutations in ATP1A1 Cause Dominant Charcot-Marie-Tooth Type 2. Am J Hum Genet 2018;102:505–514.
. Deletion of the Na/K-ATPase α1-subunit gene (Atp1a1) does not prevent cavitation of the preimplantation mouse embryo. Mech Dev 2004;121:417–426.
. The Na,K-ATPase α2 isoform is expressed in neurons, and its absence disrupts neuronal activity in newborn mice. J Biol Chem 2003;278:5317–5324.
. Deficiency in Na,K-ATPase α isoform genes alters spatial learning, motor activity and anxiety in mice. J Neurosci 2007;27:616–626.
. Na,K- ATPase subunit heterogeneity as a mechanism for tissue-specific ion regulation. Semin Nephrol 2005;25:292–303.
. Epilepsy in hemiplegic migraine: Genetic mutations and clinical implications. Cephalalgia 2018;38,361–373.
. De novo mutations in ATP1A3 cause alternating hemiplegia of childhood. Nat Genet 2012;44,1030–1034.
. ATP1A3-related neurologic disorders. 2008 Feb 7 [Updated 2018 Feb 22]. In: Adam MP, Ardinger HH, Pagon RA, et al., eds. GeneReviews® [Internet]. Seattle, WA: University of Washington; 1993–2019. Available at: https://www.ncbi.nlm.nih.gov/books/NBK1115/.
. Crystal structure of the sodium-potassium pump at 2.4 Å resolution. Nature 2009;459:446–450.
. Crystal structure of a Na+-bound Na+,K+-ATPase preceding the E1P state. Nature 2013;502:201–206.
. Crystal structure of the sodium-potassium pump. Nature 2007;450,1043–1049.
. ConSurf 2005: the projection of evolutionary conservation scores of residues on protein structures. 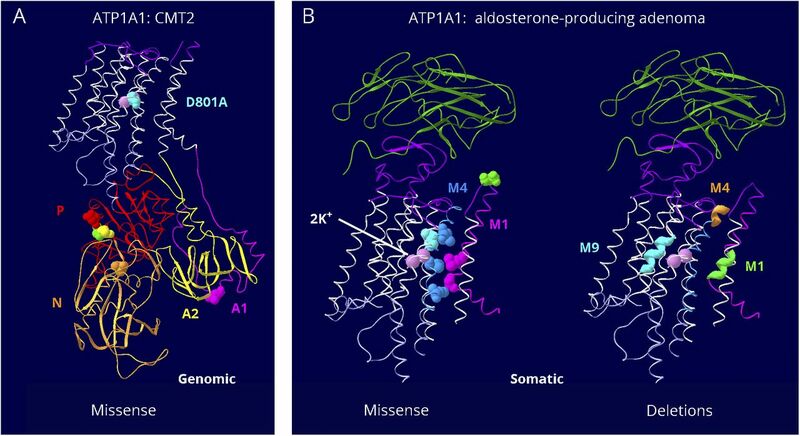 Nucleic Acids Res 2005;33:W299–W302.
. Mutations in the Na,K-ATPase α3 gene ATP1A3 are associated with rapid-onset dystonia parkinsonism. Neuron 2004;43:169–175.
. Clinical spectrum of hemiplegic migraine and chances of finding a pathogenic mutation. Neurology 2018;90,e575–e582.
. Novel mutations in ATP1A3 associated with catastrophic early life epilepsy, episodic prolonged apnea, and postnatal microcephaly. Epilepsia 2015;56,422–430.
. Relapsing encephalopathy with cerebellar ataxia related to an ATP1A3 mutation. Dev Med Child Neurol 2015;57,1183–1186.
. ATP1A3 mutation in adult rapid-onset ataxia. PLoS One 2016;11:e0151429.
. Genotype-phenotype correlations in alternating hemiplegia of childhood. Neurology 2014;82:482–490.
. The expanding spectrum of neurological phenotypes in children with ATP1A3 mutations, alternating hemiplegia of childhood, rapid-onset dystonia-parkinsonism, CAPOS and beyond. Pediatr Neurol 2015;52:56–64.
. Fever-induced paroxysmal weakness and encephalopathy, a new phenotype of ATP1A3 mutation. Pediatr Neurol 2017;73,101–105.
. The expanding clinical and genetic spectrum of ATP1A3-related disorders. Neurology 2014;82:945–955.
. ATP1A3 mutations and genotype-phenotype correlation of alternating hemiplegia of childhood in Chinese patients. PLoS One 2014;9:e97274.
. 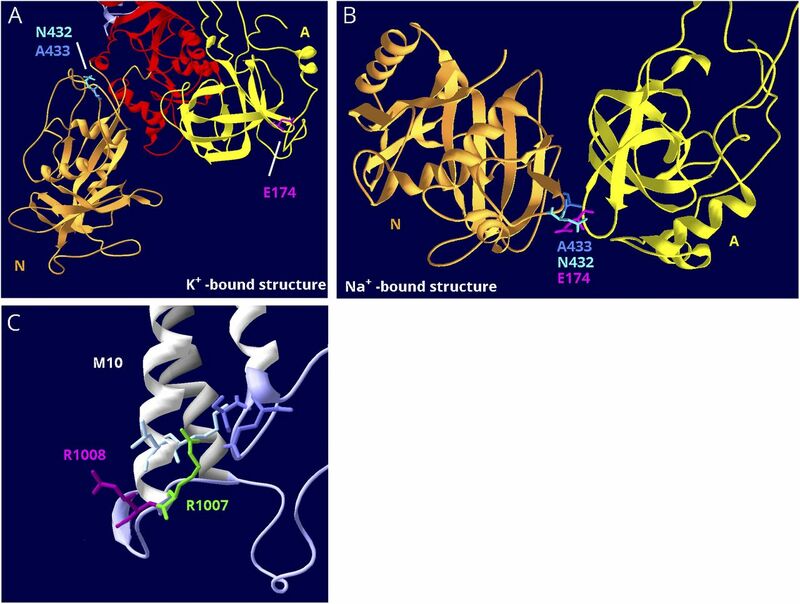 Neurological disease mutations of alpha3 Na+,K+-ATPase: structural and functional perspectives and rescue of compromised function. Biochim Biophys Acta 2016;1857:1807–1828.
. The structure and function of the Na,K-ATPase isoforms in health and disease. Front Physiol 2017;8:371.
. Somatic mutations in ATP1A1 and CACNA1D underlie a common subtype of adrenal hypertension. Nat Genet 2013;45;1055–1060.
. Somatic mutations in ATP1A1 and ATP2B3 lead to aldosterone-producing adenomas and secondary hypertension. Nat Genet 2013;45:440–442.
. Somatic ATP1A1, ATP2B3, and KCNJ5 mutations in aldosterone-producing adenomas. Hypertension 2014;63:188–195.
. Aldosterone-stimulating somatic gene mutations are common in normal adrenal glands. Proc Natl Acad Sci USA 2015;112:E4591–E4599.
. Molecular mechanism of Na+,K+-ATPase malfunction in mutations characteristic of adrenal hypertension. Biochemistry 2014;53:746–754.
. Pathogenesis of adrenal aldosterone-producing adenomas carrying mutations of the Na+/K+-ATPase. Endocrinology 2015;156:4582–4591.
. On the effect of hyperaldosteronism-inducing mutations in Na/K pumps. J Gen Physiol 2017;149:1009–1028.
. The ion pathway through the opened Na+,K+-ATPase pump. Nature 2008;456:413–416.
. ConSurf 2016: an improved methodology to estimate and visualize evolutionary conservation in macromolecules. Nucleic Acids Res 2016;44:W344–W350.
. Rare missense variants in ATP1A2 in families with clustering of common forms of migraine. Hum Mutat 2005;26:315–321.
. Familial hemiplegic migraine mutations affect Na,K-ATPase domain interactions. Biochim Biophys Acta 2013;1832:2173–2179.
. An infant with epilepsy and recurrent hemiplegia due to compound heterozygous variants in ATP1A2. Pediatr Neurol 2017;75:87–90.
. Severe attacks of familial hemiplegic migraine, childhood epilepsy and ATP1A2 mutation. Cephalalgia 2008;28:774–777.
. Functional characterization of a novel C-terminal ATP1A2 mutation causing hemiplegic migraine and epilepsy. Cephalalgia 2013;33;1302–1310.
. 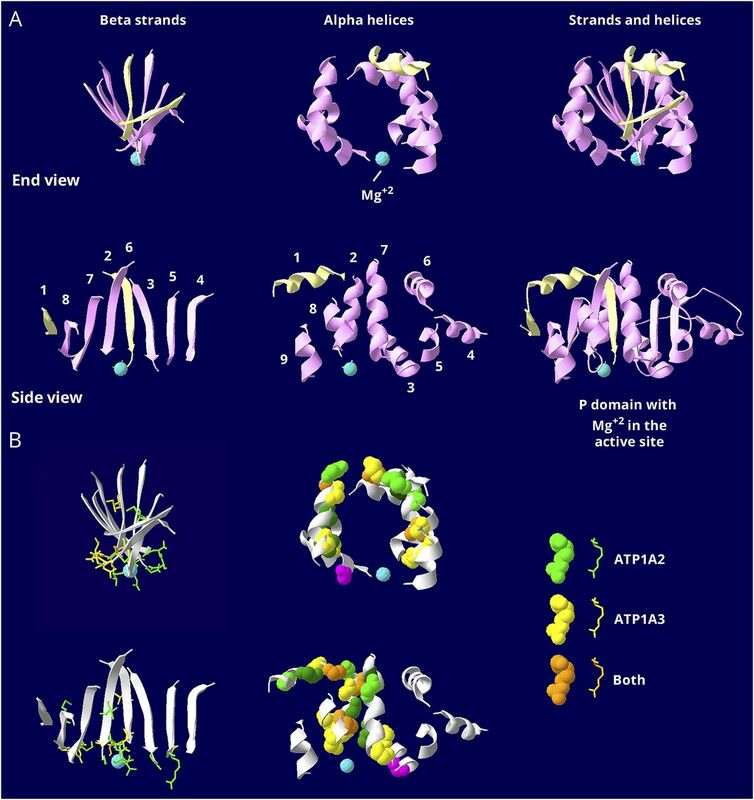 Importance of a potential protein kinase A phosphorylation site of Na+,K+-ATPase and its interaction network for Na+ binding. J Biol Chem 2016;291:10934–10947.
. Protein-phospholipid interplay revealed with crystals of the calcium pump. Nature 2017;545:193–198.
. The two C-terminal tyrosines stabilize occluded Na/K pump conformations containing Na or K ions. J Gen Physiol 2010;136:63–82.
. Na+/K+-pump ligands modulate gating of palytoxin-induced ion channnels. Proc Natl Acad Sci U S A 2003;100:501–505.
. A functional correlate of severity in alternating hemiplegia of childhood. Neurobiol Dis 2015;77:88–93.
. Hyperpolarization-activated inward leakage currents caused by deletion or mutation of carboxy-terminal tyrosines of the Na+/K+-ATPase α subunit. J Gen Physiol 2010;135:115–134.
. Ionic leakage underlies a gain-of-function effect of dominant disease mutations affecting diverse P-type ATPases. Nat Genet 2014;46:144–151.
. Cell biology of astrocyte-synapse interactions. Neuron 2017;96:697–708.
. Psychiatric disorders in rapid-onset dystonia-parkinsonism. Neurology 2012;79,1168–1173.
. Cognitive impairment in rapid-onset dystonia-parkinsonism. Mov Disord 2014;29:344–350.
. A novel de novo mutation in ATP1A3 and childhood-onset schizophrenia. Cold Spring Harb Mol Case Stud 2016;2:a001008.
. Genome sequencing identifies a novel mutation in ATP1A3 in a family with dystonia in females only. J Neurol 2015;262:187–193.
. D-DEMO, a novel and distinct phenotype caused by ATP1A3 mutations. American Academy of Neurology 2017; Meeting abstract, 2017.
. The rapid-onset dystonia parkinsonism mutation D923N of the Na+,K+-ATPase α3 isoform disrupts Na+ interaction at the third Na+ site. J Biol Chem 2010;285:26245–26254.
. [123I]-FP-CIT and [99mTc]-HMPAO single photon emission computed tomography in a new sporadic case of rapid-onset dystonia-parkinsonism. J Neurol Sci 2008;273:148–151.
. ATP1A3 mutations in infants: a new rapid-onset dystonia-Parkinsonism phenotype characterized by motor delay and ataxia. Dev Med Child Neurol 2012;54,1065–1067.
. The multiple faces of the ATP1A3-related dystonic movement disorder. Mov Disord 2013;28,1457–1459.
. A wide clinical phenotype spectrum in patients with ATP1A2 mutations. J Child Neurol 2014;29:265–268.